In order to gear up for Kick off, when this year’s new game was released, we staged an event called “Pre-Kickoff” on the 3rd and 4th of January. This entailed, for those who aren’t familiar, exactly what it sounds like. We prepared our team for what Kickoff would look like, and gave them a chance to start learning how to formulate a strategy for a game. 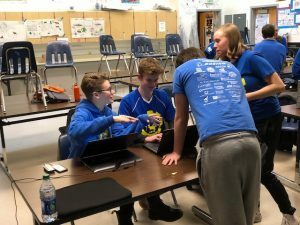 It also gave new students the opportunity to think about what it takes to build a good robot, and how that will impact our performance with other teams. The Captains chose a game from a previous year, and we divided into strategy groups after watching the game launch video, which explained the rules of the game. In these groups, our team came up with four separate strategies after delving into the details. On the whole, the event did a great job preparing the team for this year’s actual Kickoff event. Kickoff began at 6:50 am, January 6th. A collection of bleary-eyed students, mentors and family managed to file into the BHS auditorium just in time to see the FIRST Robotics live stream of the details of this years game, POWER UP. 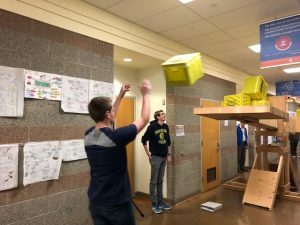 The game mostly consists of picking up cubes, while working with two other teams and competing against 3 other teams to place the most cubes on various game field elements in order to capture them and accrue points. After a flurry of planning and brainstorming, the team was able to come up with a strategy that we believe will take us far in this year’s season. With the help of our wonderful mentors, the mechanics, electrical and programming subteams have begun prototyping a robot to execute on this strategy. This marks the transition into our six week build season. 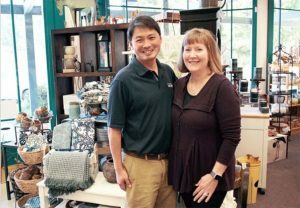 For 27 years, ACE HARDWARE of Bainbridge Island owners Steve and Becky Mikami have kept Island homes happy. They’ve supplied all the things to keep a household running, from plumbing fixtures to power tools, holiday decorations, to small appliances. Since Spartronics was born, ACE HARDWARE has been one of our biggest local supporters. Steve and Becky have visited us at our Open Houses and during build season, encouraging our students. As a Legacy Gold Sponsor, ACE HARDWARE also is a place where Spartronics buys a lot of our replacement tools and supplies during build season. But perhaps the best thing about our Island’s ACE HARDWARE owner is they not only are big supporters of Robotics and the Bainbridge Schools Foundation, they are big Bainbridge Island Community supporters and have been honored by many organizations for their good deeds. Read this great story from our media sponsor, the Bainbridge Review, here. We know Steve and Becky don’t like being in the limelight – but they deserve our thanks and praise, because without their continued support we would not have enjoyed the success we have as a team. Below is a new video we created this year to share with our top Sponsors, like ACE HARDWARE, to explain what happens with the dollars our Sponsors donate. Please watch this video to get an idea of how important our Sponsors are and why their dollars do so much for every student. Because every Spartronics student has their own story.